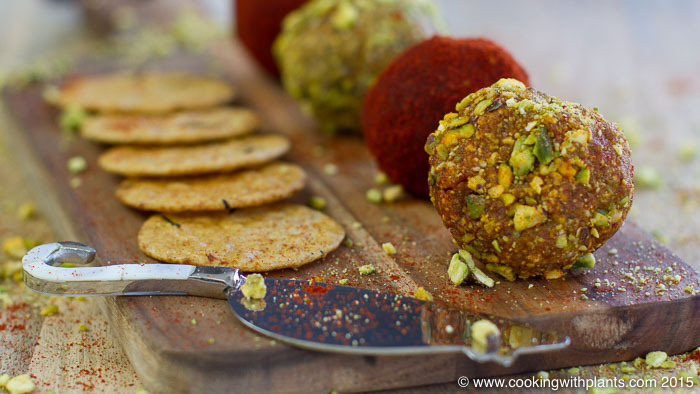 These Pistachio and Smoked Paprika Vegan Cheese Balls look great, taste great and are fast to make! Served large or small they make a great party snack or side dish. Perfect for the holiday Season… dig in! 1 tbsp Miso paste (soy or chickpea) You could also substitute with Tahini & a little extra salt. All you need for this recipe is a good food processor, a mixing spoon and a serving plate or platter. Place all Cheese ball mixture ingredients in the blender and pulse initially before blending into a smooth mixture - about 30 seconds. See video above this recipe for reference. When happy with the mixture consistency break off pieces of mixture and roll by hand into the desired size and set aside. Place the rolling mixture into separate shallow bowls - one with the paprika and one with the nuts. Now take your cheese balls and roll in your favorite coating until well covered, then place the balls on your serving plate. See notes below for more coating ideas. Alternative coatings for your balls could be dried fruit pieces like apricot or cranberry. You could also use your favorite dried herbs or nuts. I don’t include nutritional breakdowns or calories as I no longer count calories. Prior to eating a whole food plant based diet I would always get caught up with this and put on more and more weight. Now I keep it basic and eat plant based whole foods and have lost over 50 pounds and kept it off for over 3 years. 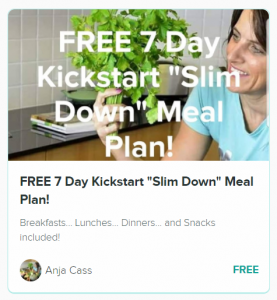 I know so many people that started eating this way and no longer worry about calories etc No more weight issues, just every day healthy living on auto-pilot 🙂 Such a great way to be. I agree, too much calorie counting etc is a nuisance and I have been doing vegan for about 4 months now and the weight is just falling off and I eat as much as I want to, it’s a new way of life for me and my husband, so healthy. Keep up the good work Anja, love it all. I agree, counting calories etc is not much fun. I have lost weight on this vegan diet without trying to do so, it’s fantastic, I am trying to cut my medicine out and it’s working for cholesterol and diabetes, half way there and next blood test I should be able to cut it out altogether, that makes me feel great, the way to go. Thanks Anja, keep up the good work. 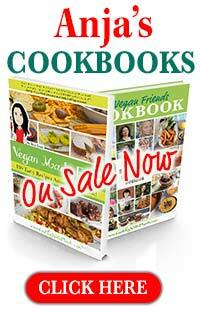 Just wanted to say I think your recipes are great and have often shared some on my recipe page on face book. 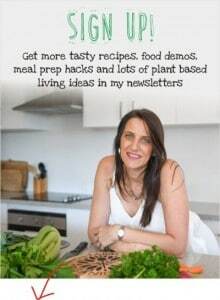 I have been a vegan for the past 18 yrs or so and still enjoy trying new recipes.I have just moved to NSW this year from the UK so I have new friends to impress with vegan cooking! I agree not to have to count calories etc being healthy is the most important thing and you know your own body and if you have put weight on or not. I am also 4th generation vegetarian. This recipe was so good! I’m the only vegan in my family and everybody loved it! They said it tasted very similar to their favorite dairy cheese! Thanks for the recipe Anja! You are an amazing cook!! Such an inspiration to me!!! Have you tried using white beans instead of the cashews? Thanks. No I have only made it with cashews as it holds everything together… I don’t think beans would do that. What cracker do you eat? ?